The canton of Valais (French pronunciation: ​[valɛ]; German: Kanton Wallis, German pronunciation: [ˈvalɪs] ( listen); Italian: Canton Vallese) is one of the 26 cantons of Switzerland, situated in the southwestern part of the country, around the valley of the Rhône from its headwaters to Lake Geneva, separating the Pennine Alps from the Bernese Alps. The canton is simultaneously one of the driest regions of Switzerland in its central Rhône valley and among the wettest, having large amounts of snow and rain up on the highest peaks found in Switzerland. The canton of Valais is widely known for the Matterhorn and resort towns such as Crans-Montana, Saas Fee, Verbier and Zermatt. It is composed of 13 districts (hence the 13 stars on the flag) and its capital is Sion. The Romans called the upper Rhône valley Vallis Poenina. The Vallis Poenina was won by the Romans after a great fight at Octodurus (Martigny) in 57 BC and became part of the Gallo-Roman cultural sphere. According to a tradition which can be traced back to the middle of the 8th century, the Theban legion was martyred at Agaunum (now Saint Maurice) about 285 or 302. From 888 onwards the lands were part of the kingdom of Jurane Burgundy. Valais formed part of the kingdom of Transjurane Burgundy, which fell to the Holy Roman Empire in 1032. It became part of the duchy of Burgundia Minor, which was held from the emperors by the house of Zähringen (which became extinct in 1218). In 999, King Rudolph III of Burgundy gave all temporal rights and privileges to the Bishop of Sion, who was later styled praefect and count of Valais and is still a prince of the Holy Roman Empire. The count-bishops then struggled to defend their area against the Zähringer and then the dukes of Savoy, so that the medieval history of Valais is inextricably linked with that of the diocese of Sion. The Dukes of Savoy, however, succeeded in winning most of the land west of Sion, while in the upper part of the valley (Upper Valais) there were many feudal lords, such as the lords of Raron, those of La Tour-Châtillon, and the counts of Visp. About the middle of the 13th century, the large communities (Zenden or tithings) began to develop independence and grow in power. The name Zenden or tithings probably came from a very ancient division of the bishop's manors for administrative and judicial purposes. In the same century the upper part of the valley was colonized by Germans from Hasli in the Canton of Bern. The locals became German speaking, though many Romance local names still remain. In 1354 the liberties of several of the seven Zenden (Sion, Sierre, Leuk, Raron, Visp, Brig and Conches) were confirmed by the Emperor Charles IV. By the late 14th century, the counts of Savoy acquired the bishopric of Sion. The Zenden resisted his attempts to gather both spiritual and secular power in the valley. In 1375-76, Zenden forces crushed the army of the house of La Tour-Chatillon, and in 1388 utterly defeated the forces of the bishop, the count and his nobles at Visp. The German-speaking Zenden spread further into the valley. Starting in 1384 the Morge stream (a little below Sion) was recognized as the boundary between Savoyard, French-speaking Lower Valais and German-speaking episcopal Upper Valais. During the Raron affair rebellion in 1414 to 1420, some cantons of the Swiss Confederation took sides in the conflict. Lucerne, Uri and Unterwalden supported the Upper Valais rebels, while Bern supported the noble Raron family. The uprising was successful in driving out the Rarons, and almost brought the Confederation to civil war. Following the violence of the Raron affair, the canton was the location of the Valais witch trials between 1428 and 1447 in which at least 367 men and women were put to death. This event marks one of the earliest witch scares in late medieval Europe. The phenomenon later spread to other parts of the continent. With the election of Walther von Supersax of Conches as bishop in 1457, the German-speaking part of the valley finally won the supremacy. At the outbreak of the Burgundian War in 1475 the bishop of Sion and the Zenden made a treaty with Bern. In November of the same year they seized all Lower or Savoyard Valais up to Martigny. In March 1476, after the victory of Grandson, they advanced and captured St Maurice, Évian, Thonon and Monthey. They had to give up the last three districts in 1477, but won them again in 1536. In the treaty of Thonon in 1569, Monthey, Val-d'llliez and Le Bouveret were permanently annexed to Valais. These conquered districts in the Lower Valais were always ruled as subject lands by the bishop and Zenden of the Upper Valais. On March 12, 1529, Valais became an associate member (Zugewandter Ort) of the Swiss Confederation. Valais resisted the Protestant Reformation, remaining faithful to the Roman Catholic Church. In 1628 Valais became a republic, the République des Sept Dizains/Republik der Sieben Zehenden, under the guidance of the prince-bishop of Sion and the bailli. The bishop remained in power until 1798 when Napoleon's troops invaded Valais and declared a Revolutionary République du Valais (March 16) which was swiftly incorporated (May 1) into the Helvetic Republic until 1802 when it became the separate Rhodanic Republic. In 1810 the Rhodanic Republic was annexed by Napoleonic France as the département of Simplon. Independence was restored in 1813, and on August 4, 1815 Valais finally entered the Swiss confederation as a canton. In 1845, Valais joined the Catholic separate league (Sonderbund) which led to what is called the Sonderbund War. 99,000 Swiss Federal troops under General Henri Dufour were faced by 79,000 Separatists, but in the end Valais chose not to fight. The canton of Valais lies in the southwest of Switzerland. To its south lies Italy (Aosta Valley and Piedmont), to the southwest France (Auvergne-Rhône-Alpes). To the north the canton is bounded by the Swiss cantons of Vaud and Bern; the cantons of Uri and Ticino lie to its east. The wide, glacial Rhône valley dominates the area. There are many side valleys which branch off the main valley. These vary from narrow and remote to reasonably populous and popular. At the head of the Mattertal valley lies Zermatt, a pretty tourist village dominated by views of the Matterhorn (4,478 m). Fifty of the mountains exceed 4,000 m with the highest, Monte Rosa, reaching 4,634 metres (15,203 ft), and there are numerous glaciers including several of the largest in the Alps, such as the Grand Aletsch, Fiescher, and the Gorner Glaciers. 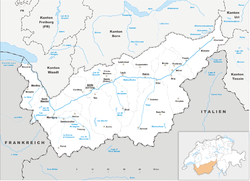 The Rhône drains almost the entire canton and flows in the main valley from east to west down to Martigny, then in a right angle north to its mouth in Lake Geneva. After the small town of Saint-Maurice, the north-eastern banks of the river belong to the canton of Vaud. However two areas are located on the south side of the Alps and are drained by the Po: the valley south of the Simplon Pass and the small area south of the Great St. Bernard Pass. The main valley is bounded by the Bernese Alps in the north and the Pennine Alps in the south. Other ranges situated partially in Valais are the Chablais Alps, the Mont Blanc Massif, the Urner Alps and the Lepontine Alps. Only about half of the total area is considered productive. There are 143 municipalities in the canton (As of 2009[update]). The western part of Valais (Central and Lower Valais) is French-speaking, while the eastern part (Upper Valais) is German-speaking. The language border crosses the Rhône between the towns of Sierre and Salgesch and follows the mountain ridge including Bella Tola, Weisshorn and Dent Blanche. At the 2000 census, 62.8% of the population of Valais spoke French or Arpitan, 28.4% spoke German or Walser German, 2.2% spoke Italian and 6.6% spoke other languages. Only 114 people reported speaking Romansh. The canton is sparsely populated. Its population (as of 31 December 2017) is 341,463. As of 2007[update], the population included 57,061 foreigners, or about 19.1% of the total population. The largest towns are the capital Sion (Sitten), Monthey, Sierre, Martigny and Brig-Glis. There is no major city located in the canton. As of 2017, 77% of total population is Roman Catholic, while only 6% are members of Swiss Reformed Church. Wine and fruit brandies, e.g. "Williamine" production and tourism are some of the main industries of the canton. Agriculture is important, particularly cattle breeding in the mountains and dairy farming in the plains. The wine industry of the canton is the largest in Switzerland. There are also a large number orchards in the area, and saffron is also gathered here. Europe's tallest gravity dam is located at Grande Dixence in the canton. Hydroelectric power plants from the canton produce about a quarter of Swiss electricity. The west part and the most industrial region of the canton is called Chablais. The area is very important for the economy. The lands from Lake Geneva to the town of St-Maurice are located in the Chablais. There are a lot of factories, the most important are the subsidiaries of Novartis and Syngenta, in Monthey. In the town of Collombey-Muraz, there is an oil refinery. Near Visp there is a large aluminium processing plant. Other metal products and chemicals are produced around Visp and Sierre, including Swiss Diamond International aluminum cookware. Valais has a long touristic tradition. Hoteliers were at the base of the development of Valais Tourism. Many of them, such as César Ritz, spent time and money to satisfy a clientele from around the world. The Matterhorn near Zermatt is one of the biggest tourist attractions in the Swiss mountains, as is its sister valley immediately east Saas Fee. Other parts of the mountains of the canton further west are popular as well, such as the more French-speaking resorts near Verbier and the Evolene and Arolla region. The resorts on the north side of the main Rhône valley are popular, looking out southwards towards the Peninne Alps and still part of the southern slope of the Bernese Alps, such as the family-oriented resort of Crans-Montana. The resorts in the Goms (district) are slightly less known, yet also receive attention during the summer hiking season and the winter ski season. A small airport is located at Sion, but the main routes of transport are rail and road. Both networks are extensive and benefit from tourism. There are three major rail tunnels at the Simplon (Simplon Tunnel), Lötschberg (Lötschberg Tunnel) and Furka (Furkatunnel) and a road tunnel at the Great St Bernard. Many of the road passes are well known, such as the Grimsel Pass. The longest land tunnel in the world, the Lötschberg Base Tunnel, is in operation since late 2007, connecting by rail the town of Frutigen in the Canton of Bern, with the town of Visp in canton Valais/Wallis. This is to better allay car traffic in the highly scenic Kandertal, and also to provide faster transport through the Bernese Alps from the populous Mittelland in the north to the southern canton of Valais. Cars may be loaded onto the trains as freight. The old train line still carries traffic particularly road traffic as freight, and has highly scenic sections in both cantons on either side of the old tunnel through the dividing ridgeline, yet is somewhat slower than the new route which has a much longer tunnel section. Because of the tourism there are many mountain railways and cable cars in the mountains. The scenic rail route across the Furka Pass originates in the canton of Valais. One or more of the preceding sentences incorporates text from a publication now in the public domain: Chisholm, Hugh, ed. (1911). "Valais" . Encyclopædia Britannica (11th ed.). Cambridge University Press. ^ Raron Affair in German, French and Italian in the online Historical Dictionary of Switzerland. ^ Canton of Valais in German, French and Italian in the online Historical Dictionary of Switzerland. ^ "Liste officielle des communes de la Suisse - 01.01.2008". Office fédéral de la statistique. Archived from the original on 12 June 2009. Retrieved 15 December 2008. ^ Georges Lüdi, Iwar Werlen (Hrsg. ):Sprachlandschaft in der Schweiz. Bundesamt für Statistik, Neuchâtel, April 2005. ^ Federal Department of Statistics (2008). "Ständige Wohnbevölkerung nach Staatsangehörigkeit, Geschlecht und Kantonen". Archived from the original (Microsoft Excel) on 2008-12-15. Retrieved November 5, 2008. Wikivoyage has a travel guide for Valais.